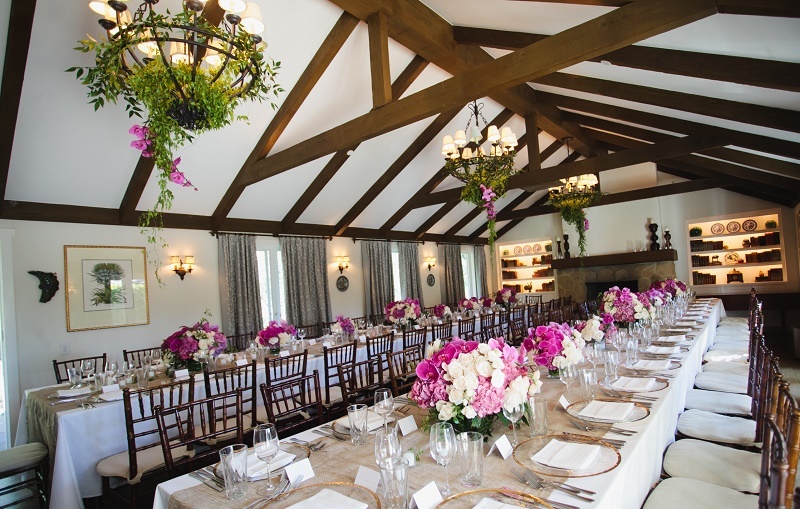 AN IDYLLIC WEDDING DESTINATION, the San Ysidro Ranch is nestled among 500 acres in the Montecito foothills of Southern California’s wine country. 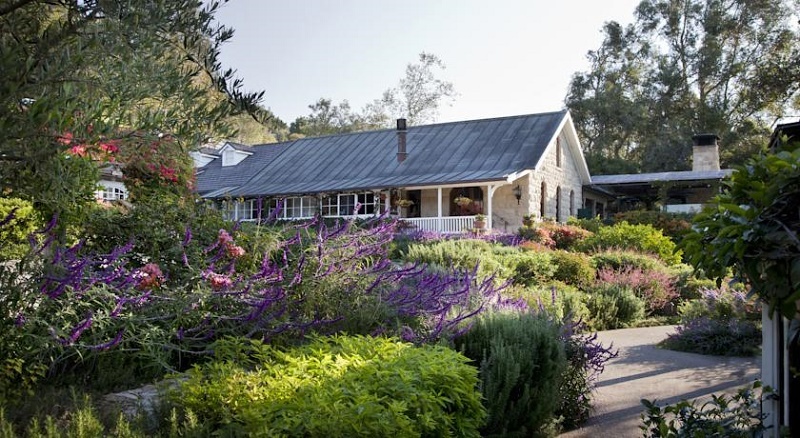 Not only has the Ranch served as a serene holiday destination for over a century, but engaged couples have fallen in love with its natural beauty and romantic heritage. 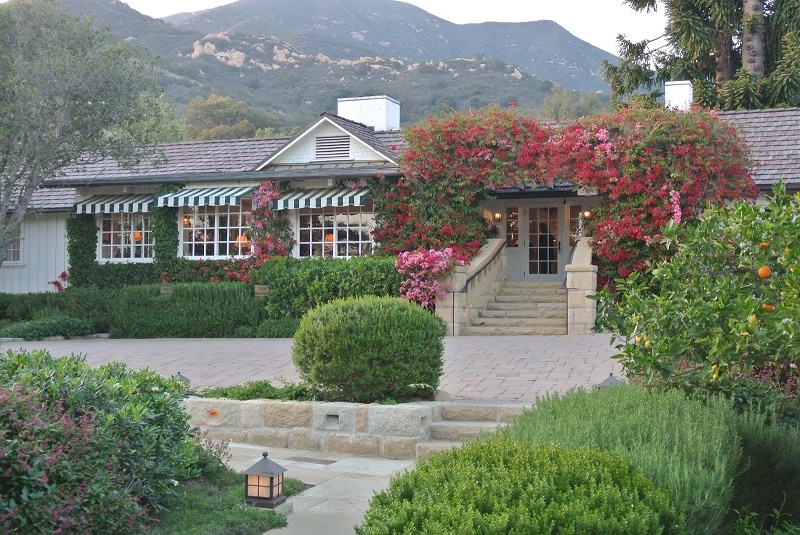 In fact, Vivien Leigh and Sir Laurence Olivier exchanged their wedding vows at the Ranch; and, John F. and Jackie Kennedy enjoyed the private bungalow setting as their honeymoon retreat. 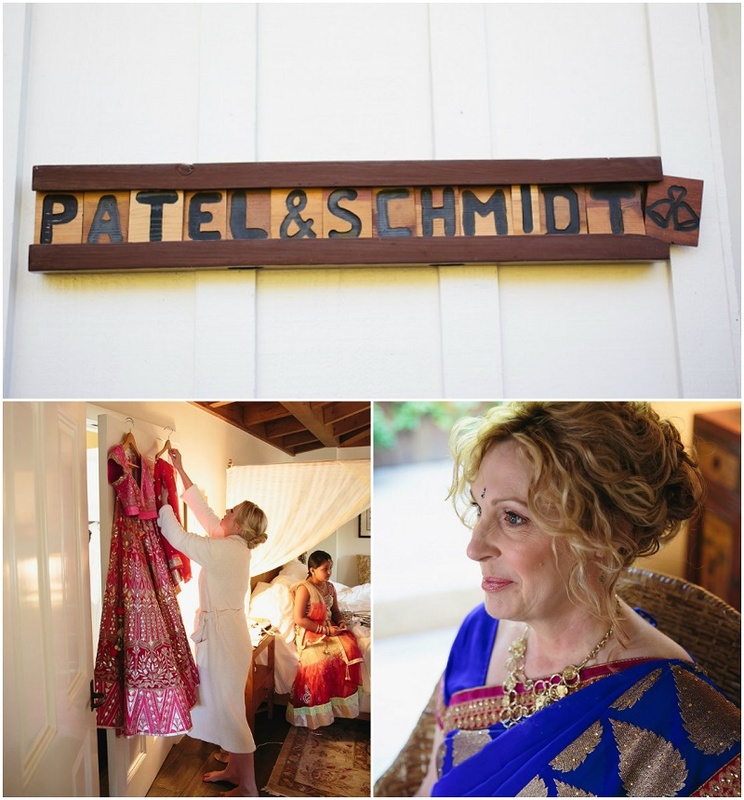 Well, our clients Kelly and Minesh, were also bewitched by the Santa Barbara hideaway. 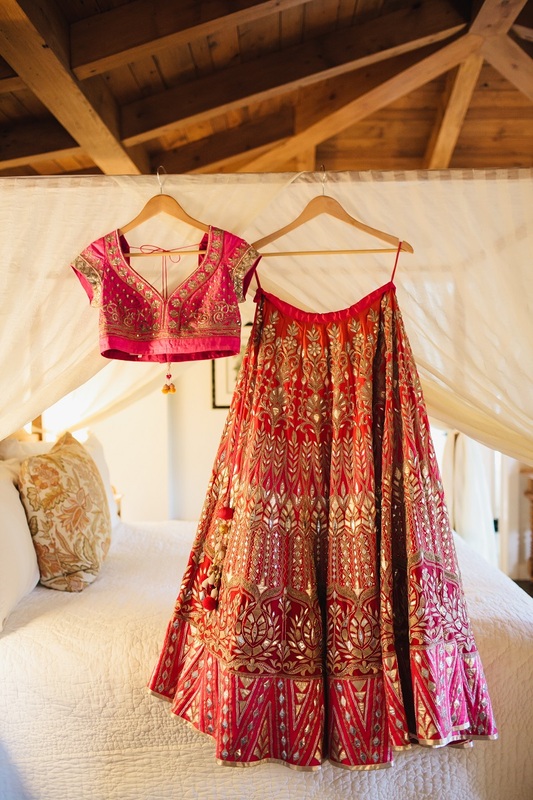 Who wouldn’t? 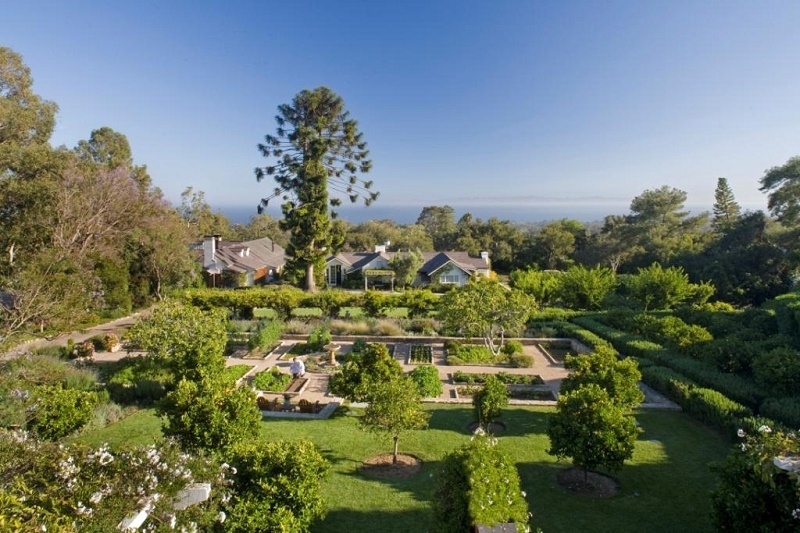 Its homey-yet-classic cottages meander along San Ysidro’s hillside creek, the Pacific Ocean is viewed over stunning gardens, and mesmerizing tree-lined paths mezmerize the romantic in all of us. 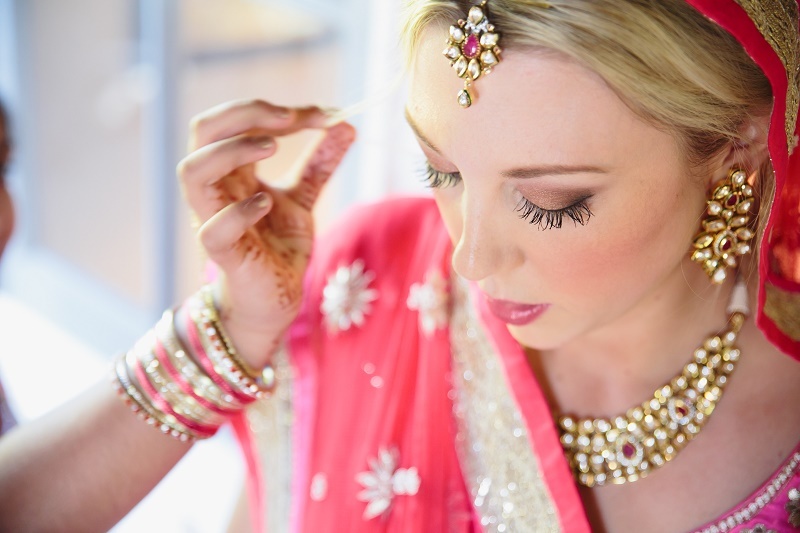 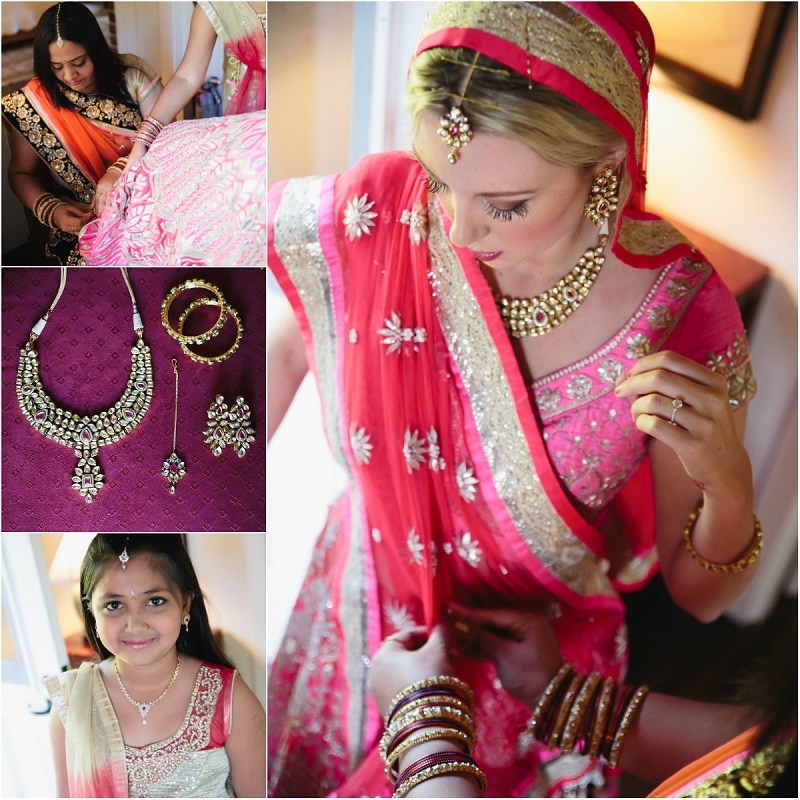 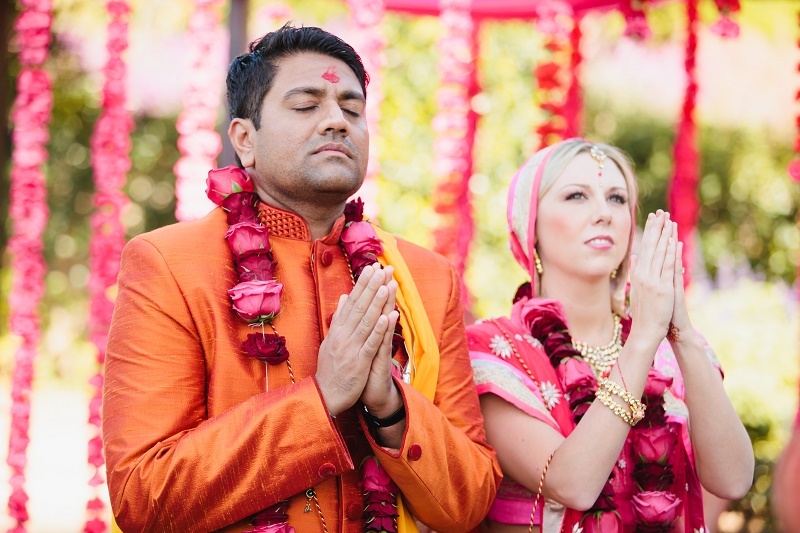 But the Ranch wasn’t Kelly and Minesh’s first choice for their Hindu Christian Wedding. 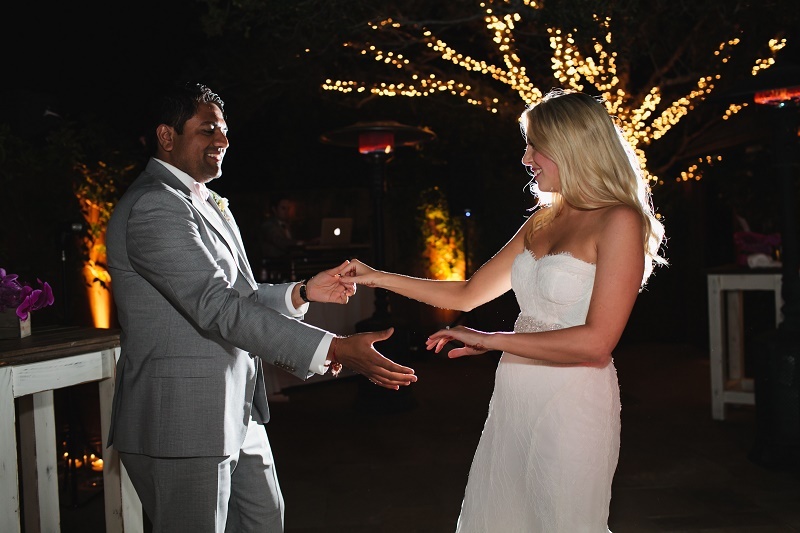 Originally, Los Cabos, Mexico was where they intended to celebrate their wedding; however, Hurricane Odile turned those well-laid plans upside down. 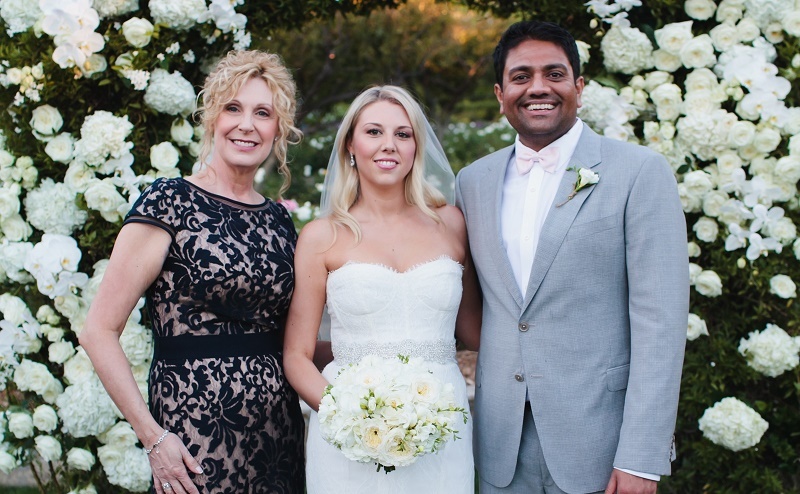 But as you will see, their dream wedding wasn’t ruined, not at all. 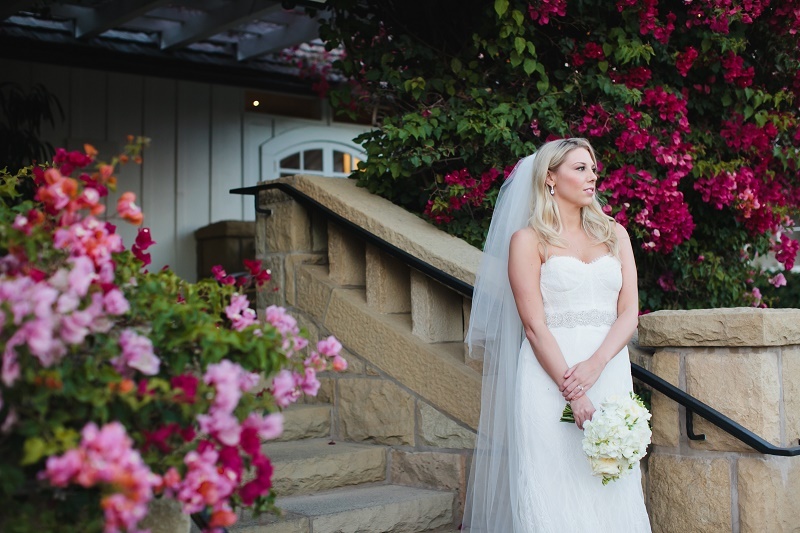 If anything, the beauty of their wedding day was elevated into saturated bliss at the San Ysidro Ranch! 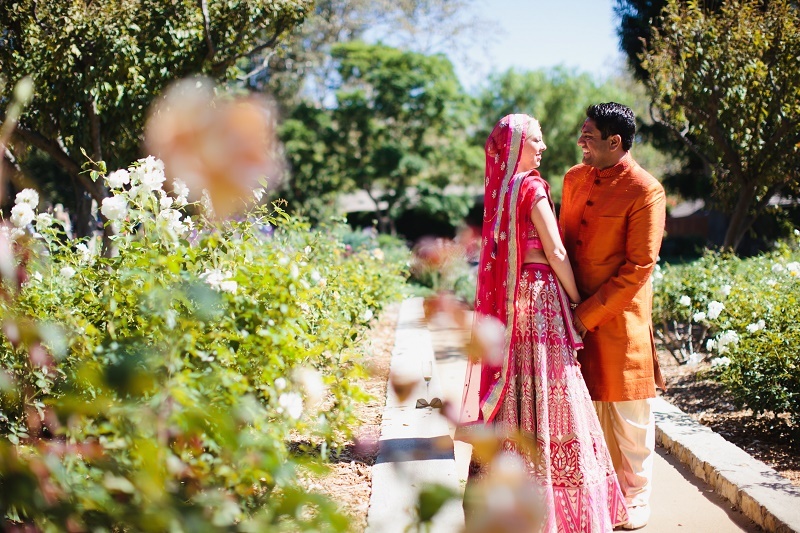 THE FRAGRANT GARDENS AND ENDLESS GREEN LAWNS at the Ranch were the perfect locations for Kelly & Minesh’s intimate outdoor celebration. 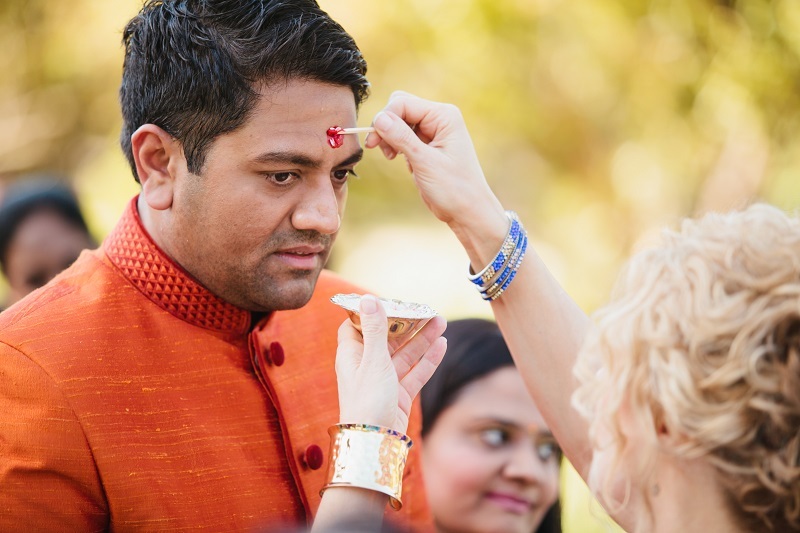 A modern blend of Hindu rituals, Indian customs and sentimental Christian traditions, their wedding day began with the first of two wedding ceremonies. 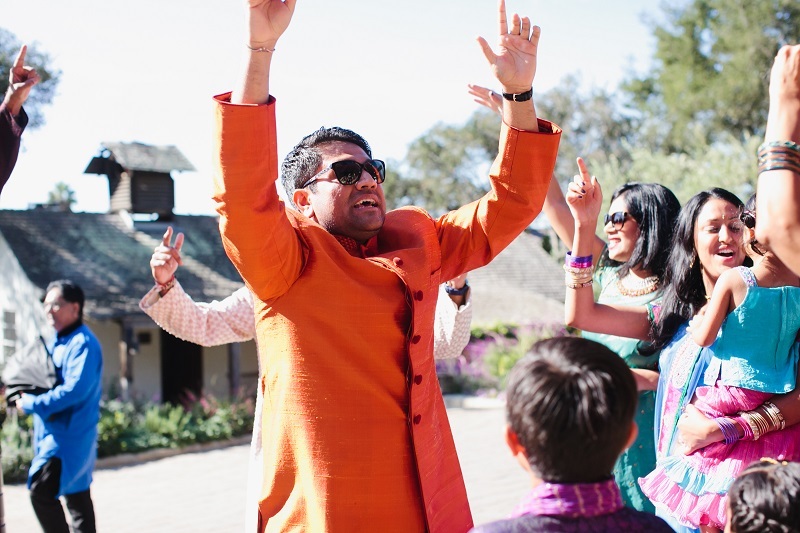 THE GROOM’S PROCESSION was, like everything else Minesh does, completely high energy fun! 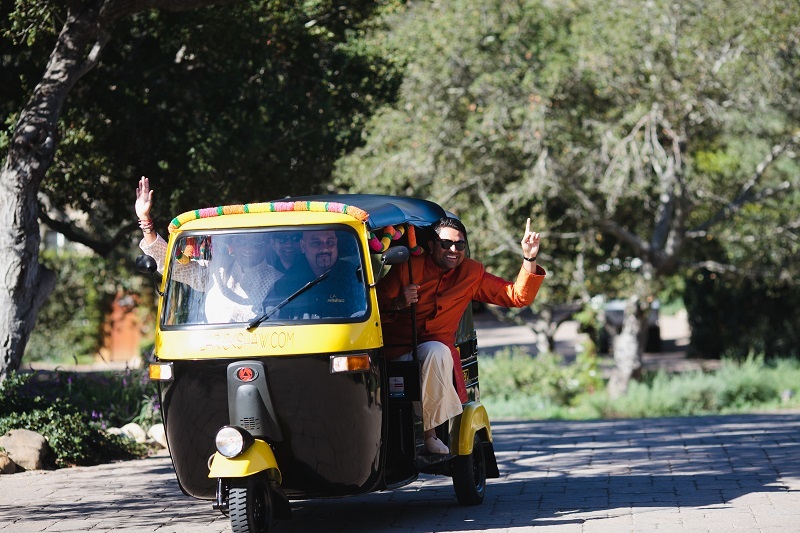 Accompanied by his family and friends in a festive procession known as the baraat, Minesh arrived at the ceremony in a decorated rick shaw. 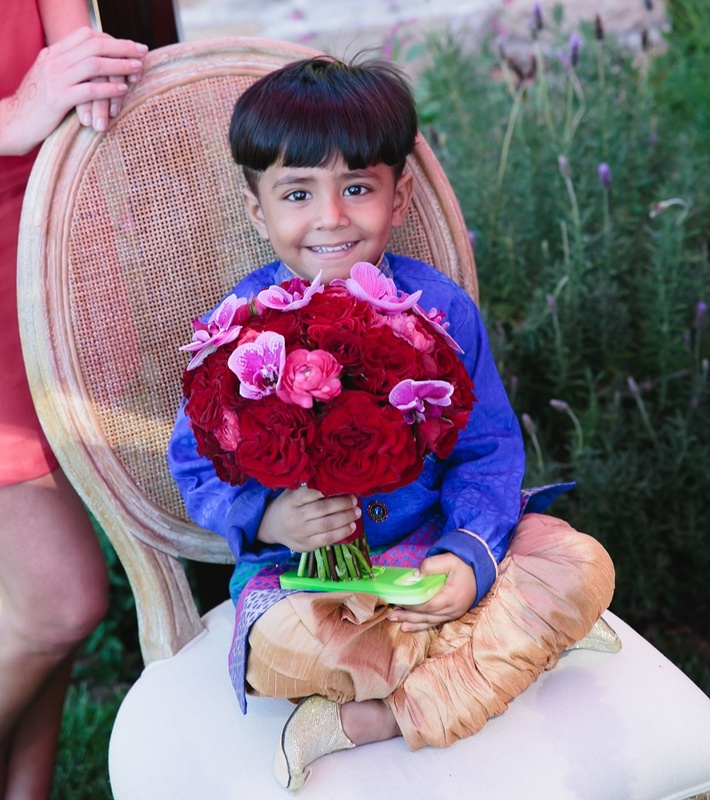 Then, with his family and friends singing and dancing around him, Minesh boogied his way through the gardens and over to where Kelly’s family was waiting for him. 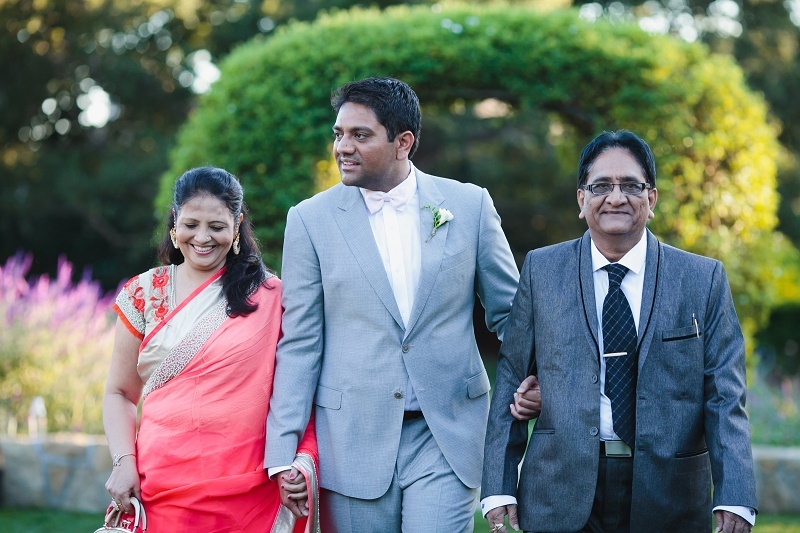 THE BRIDE’S MOTHER AND FAMILY greeted Minesh at the entrance to the ceremony in a welcoming ceremony called the milni. 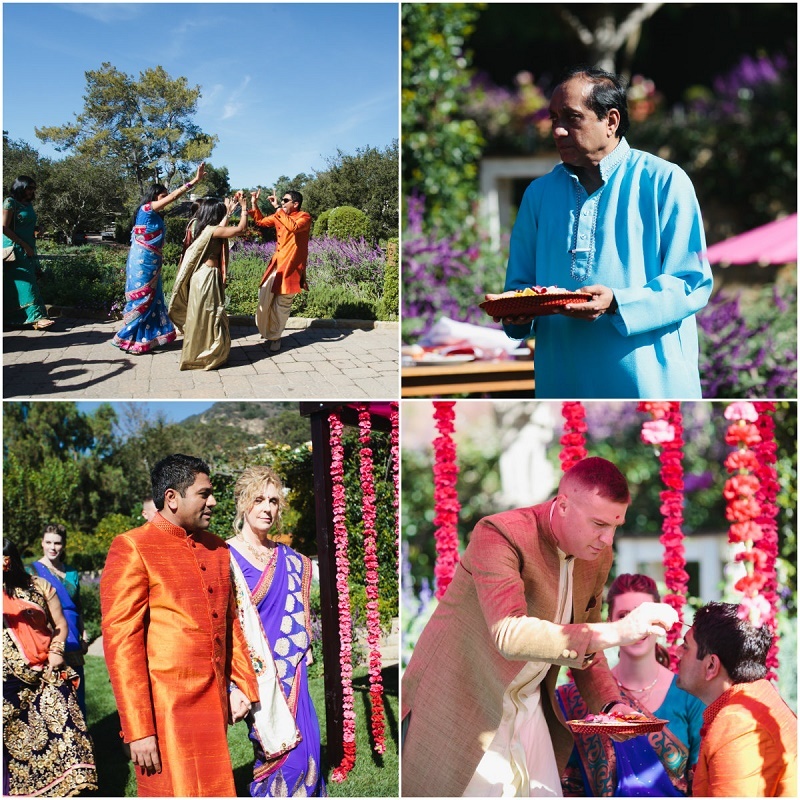 From there, Kelly’s mom escorted Minesh to the mandap, a canopied altar where the ceremony is performed and which represents the home that the bride and groom will make together. 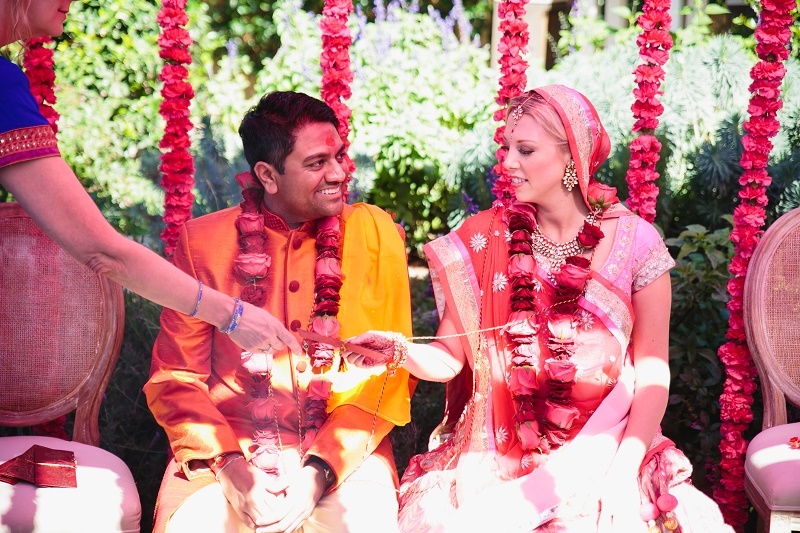 We decorated the mandap with floral garlands and fabric in a minimalist design. 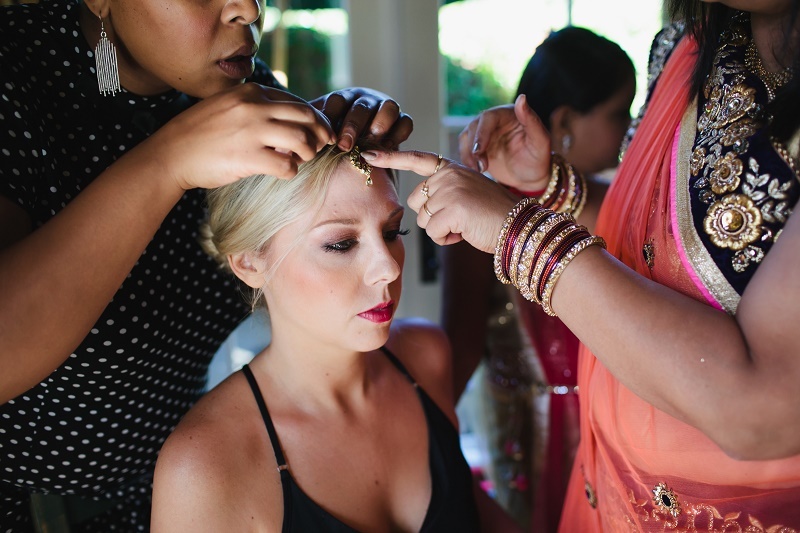 KELLY ARRIVED IN HIGH STYLE and was escorted to the mandap in the Kanya Aagaman. 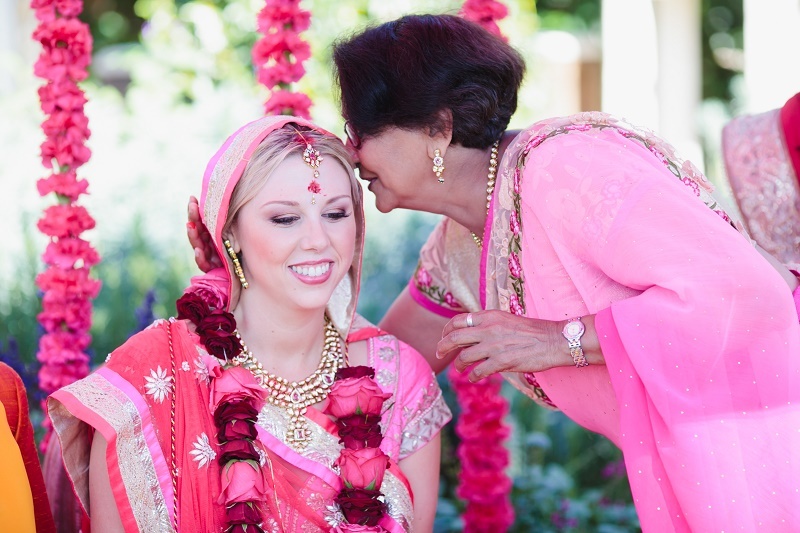 Although not traditional in Hindu ceremonies, Kelly chose to carry a bridal bouquet and we fashioned one for her with deep red roses, hot pink ranunculus and magenta orchids. 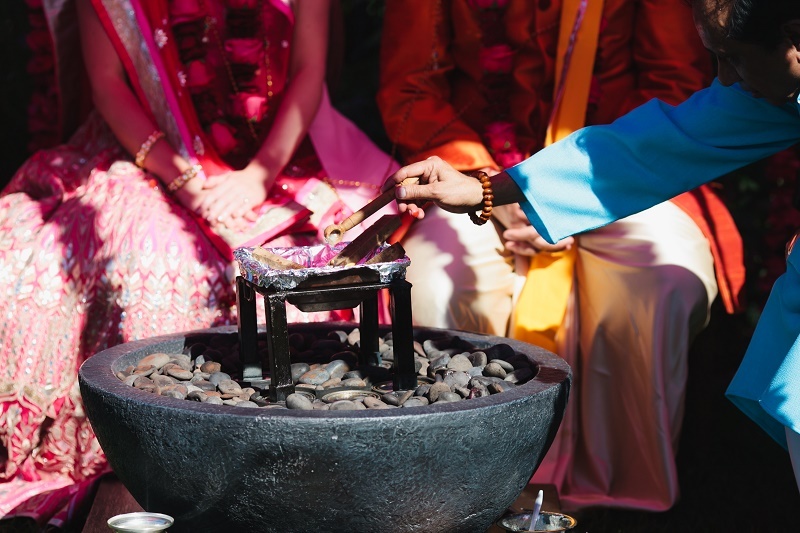 Under the mandap where Minesh waited, the ceremony continued with the Exchange of Garlands signifying their acceptance of one another; the Giving Away of the Bride; the Lighting of the Sacred Fire symbolizing the divine presence as a witness of the ceremony; and the Circling of the Sacred Fire asking for seven blessings of the union. 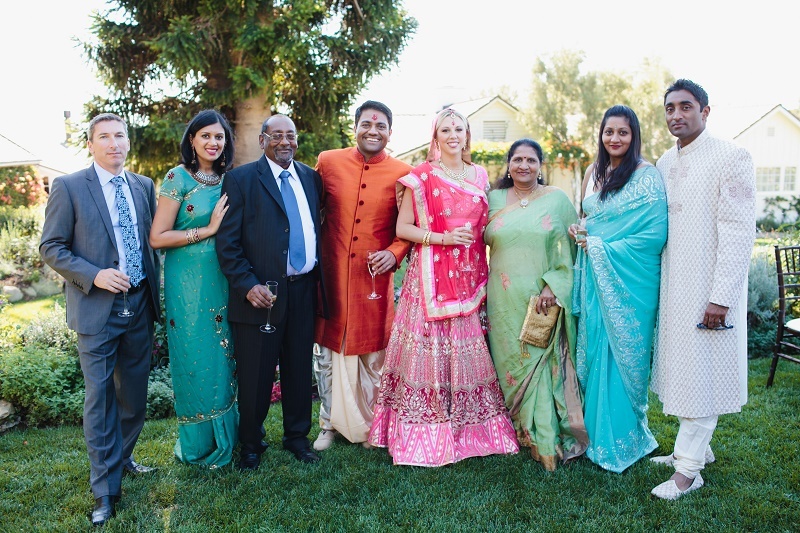 AFTER THE HINDU CEREMONY Kelly and Minesh had photos taken with family and friends before heading off to change for the second wedding ceremony of the day. 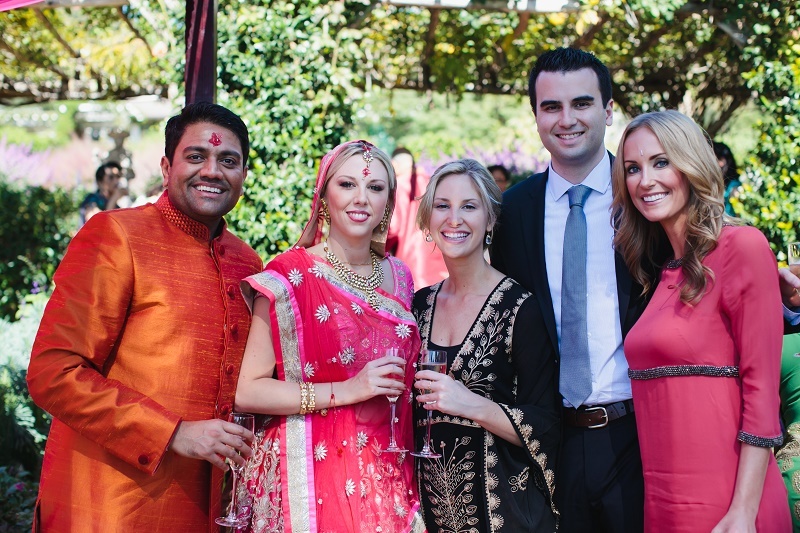 While they prepared for the Christian ceremony, their wedding guests enjoyed cocktails and hors d’oeuvres in the terraced gardens. 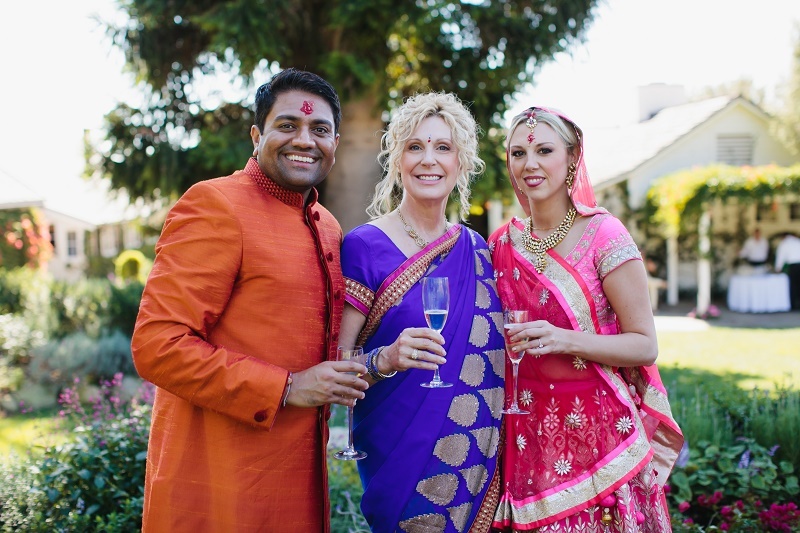 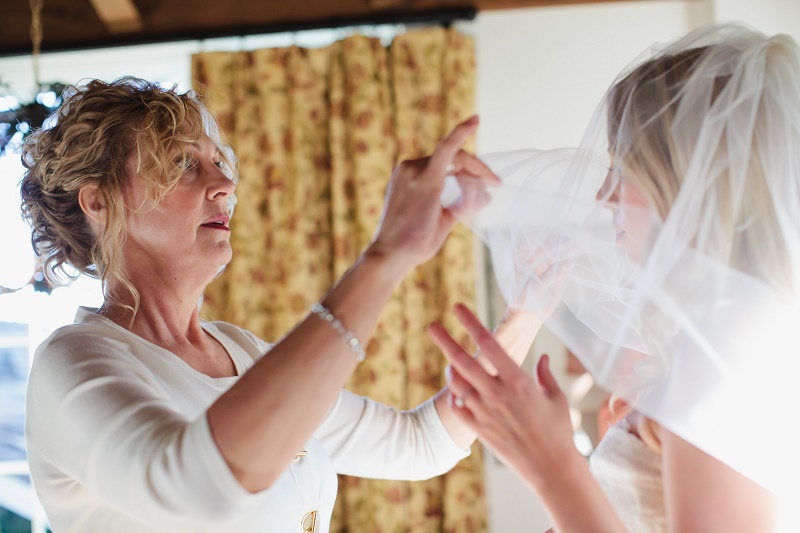 CELEBRATING WITH TWO CEREMONIES is beautiful but can make for a longer day for all involved. 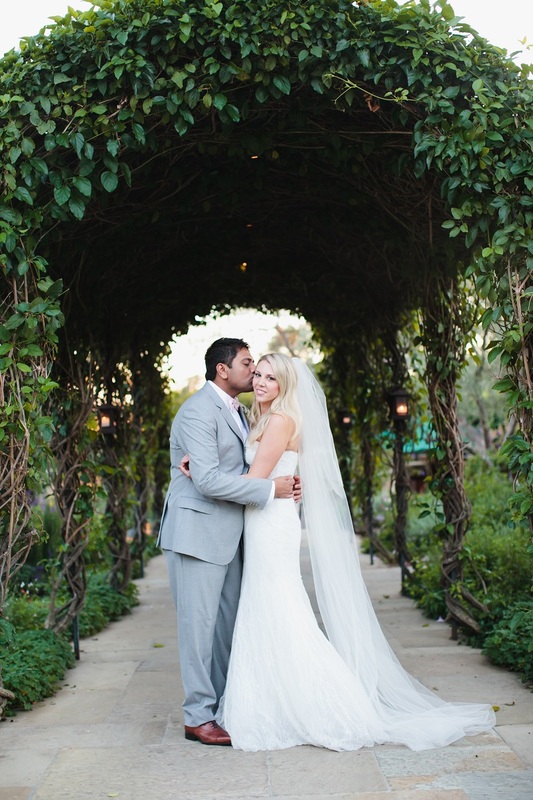 But in these tranquil settings at the San Ysidro Ranch, Kelly and Minesh’s wedding day was anything but long. 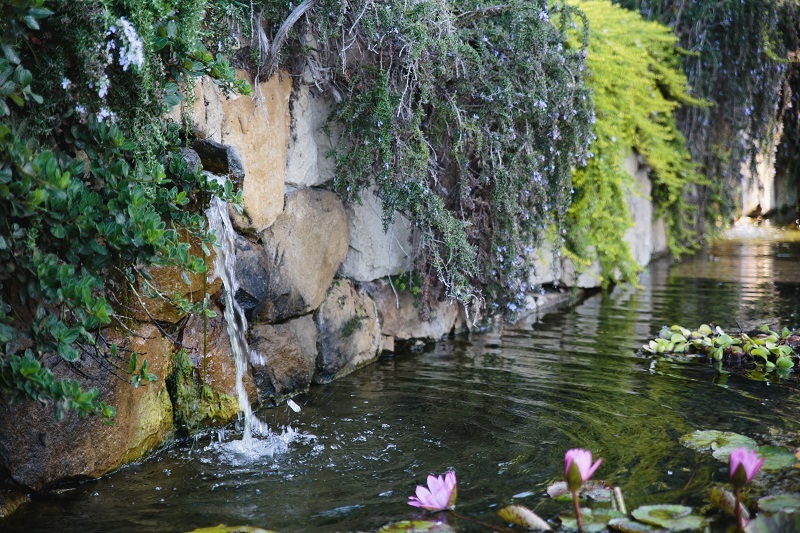 It gave everyone the opportunity to spend time together, stroll the gardens, relax and enjoy rather than hurry from one rushed moment to the next. 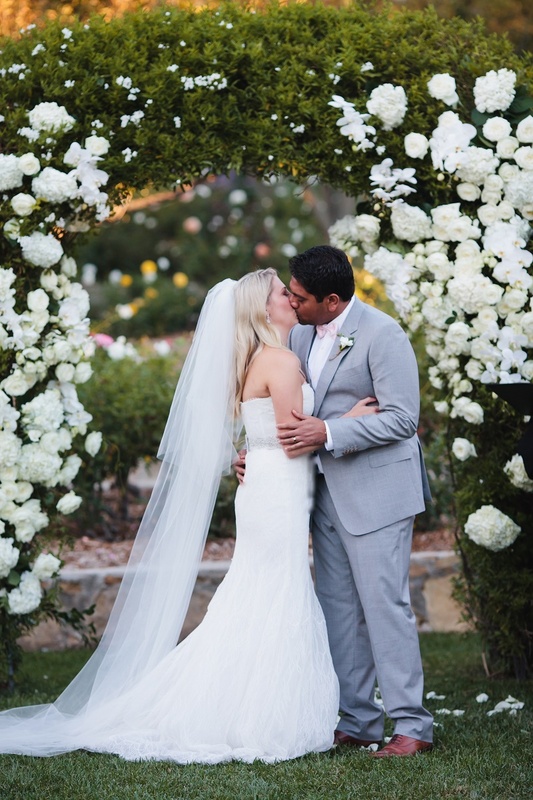 DRESSED IN WHITE LACE in a dreamy strapless Monique Lhuillier gown, strappy Jimmy Choo sandals and a frothy chapel length veil, Kelly looked gorgeous! 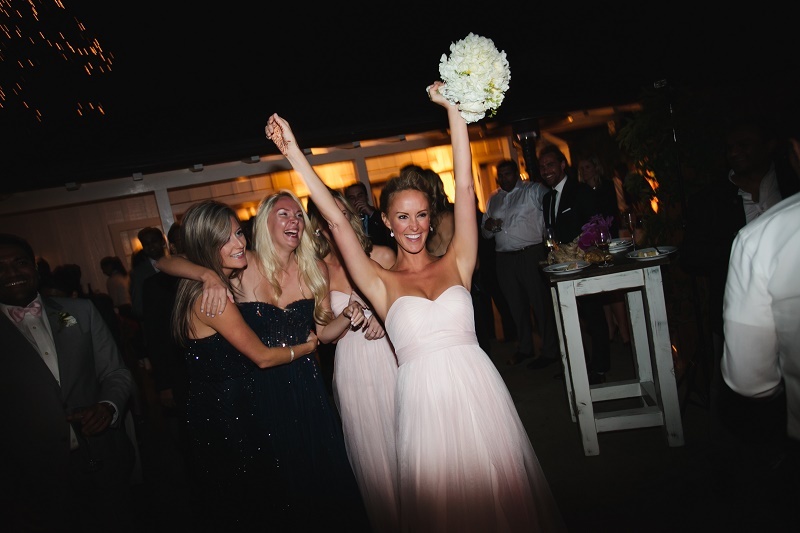 As did her bridesmaids who wore strapless gauzy gowns in blush pink tulle. 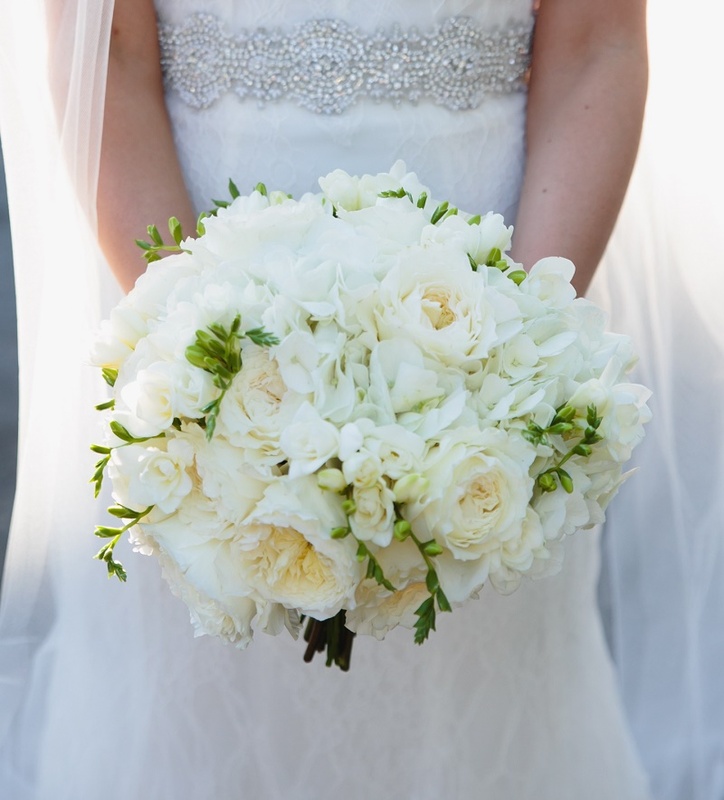 KELLY CARRIED A BRIDAL BOUQUET in tones of white and ivory with roses, hydrangea and freesia as the chosen blooms. 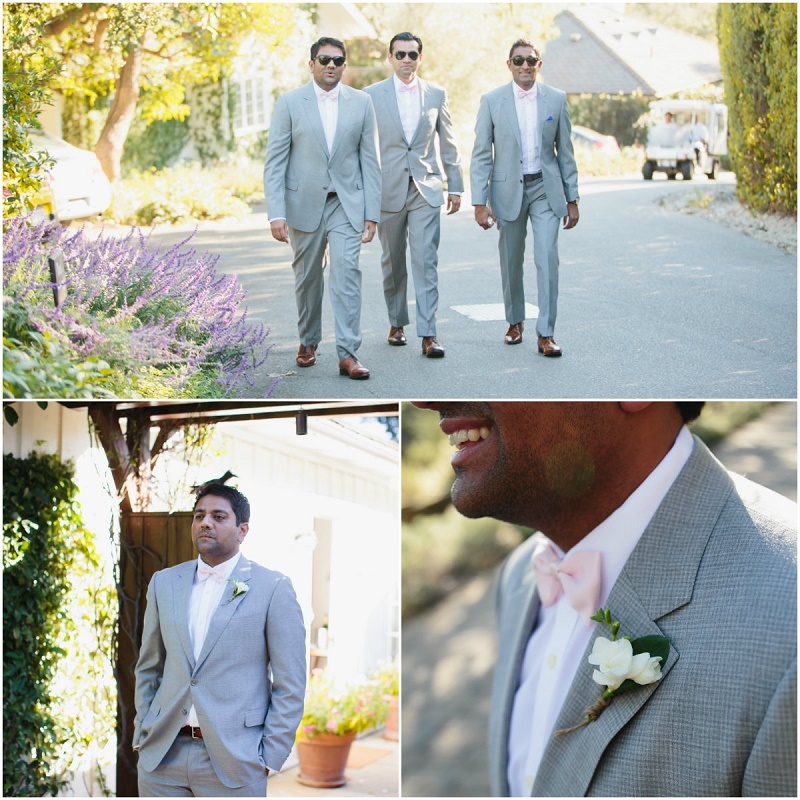 Minesh and his groomsmen changed into soft gray suits and pale pink bow ties. 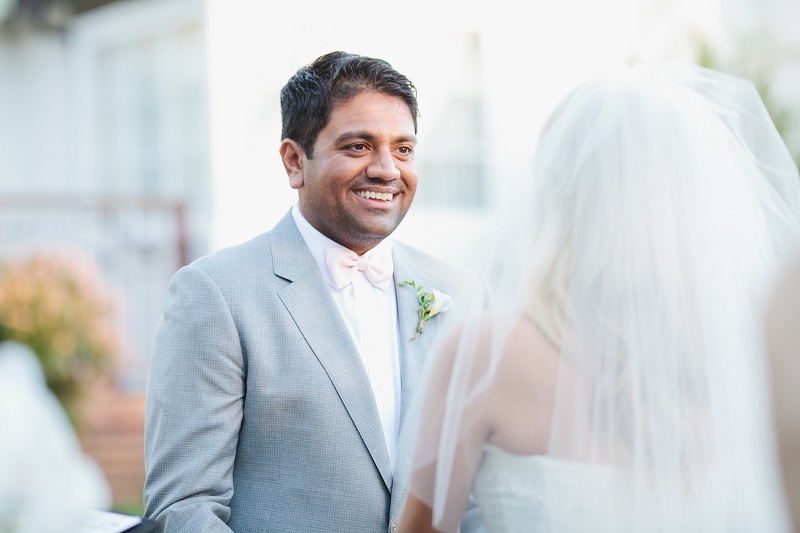 Small boutonnieres of white freesia were elegant accessories on their classic lapels. 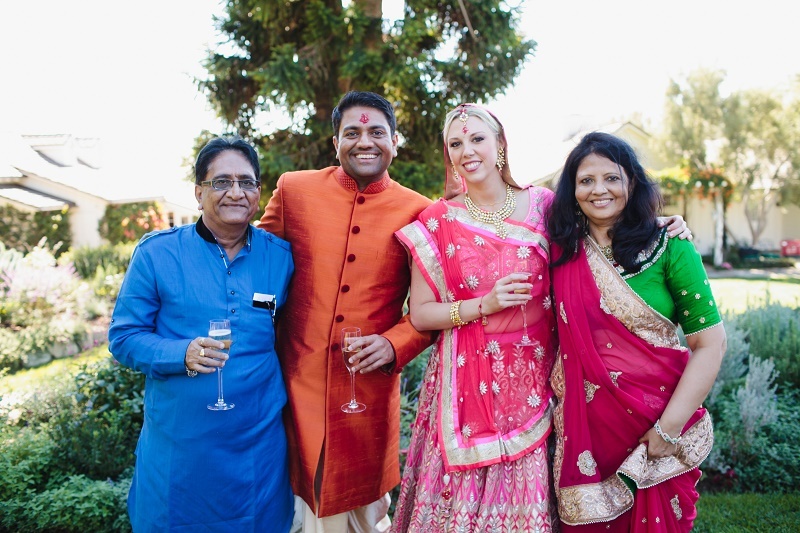 AFTER SEEING EACH OTHER IN THEIR WESTERN WEDDING ATTIRE, Kelly and Minesh, as well as their bridal party, headed out for some formal photographs on the hotel grounds. 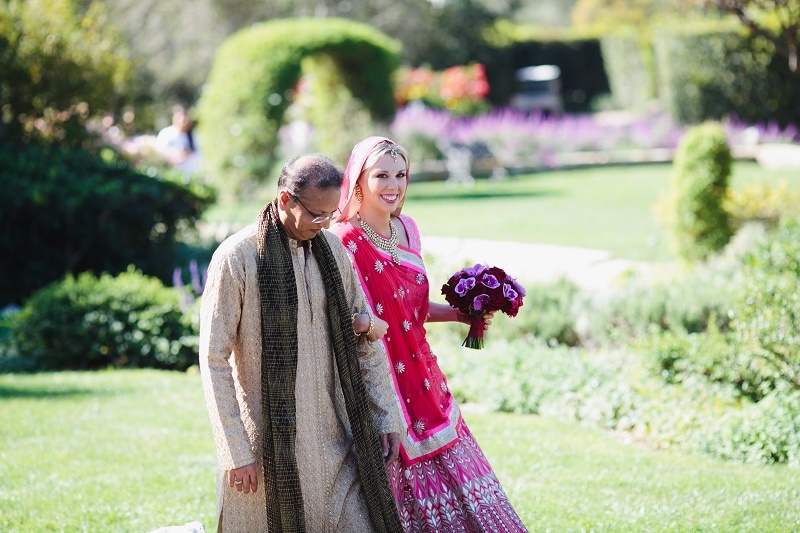 The allée of olive trees was particularly beautiful, don’t you think? 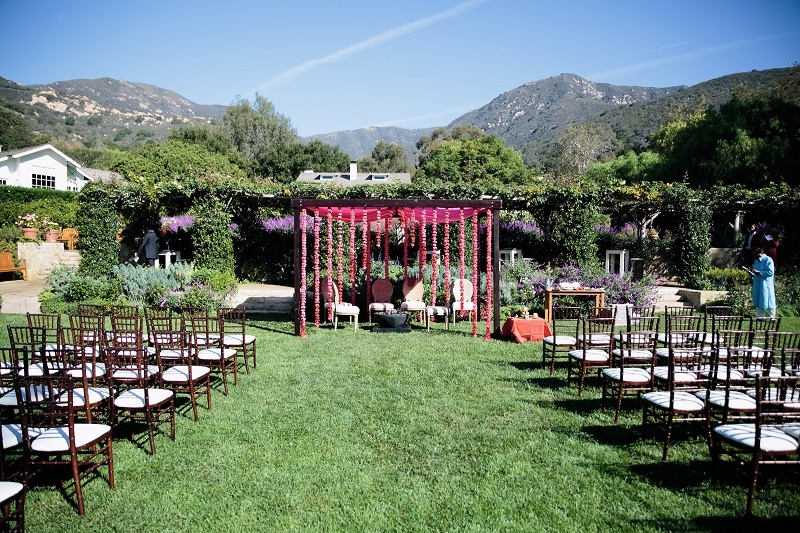 THE WESTERN WEDDING CEREMONY took place just before sunset in another lovely garden at the inn, this time, in front of a sculpted arbor we covered in creamy roses, phalaenopsis orchids and hydrangea blossoms. 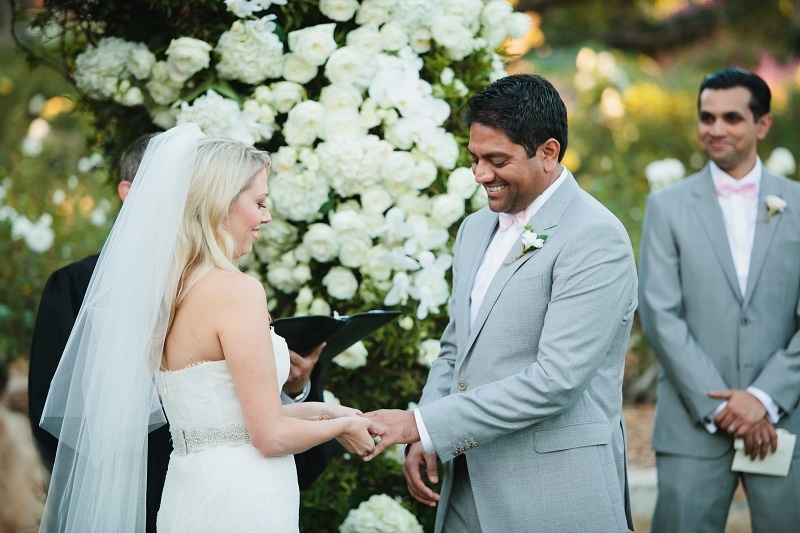 We lined the ceremony aisle with fragrant white rose petals and guests were seated in polished fruitwood reception chairs. 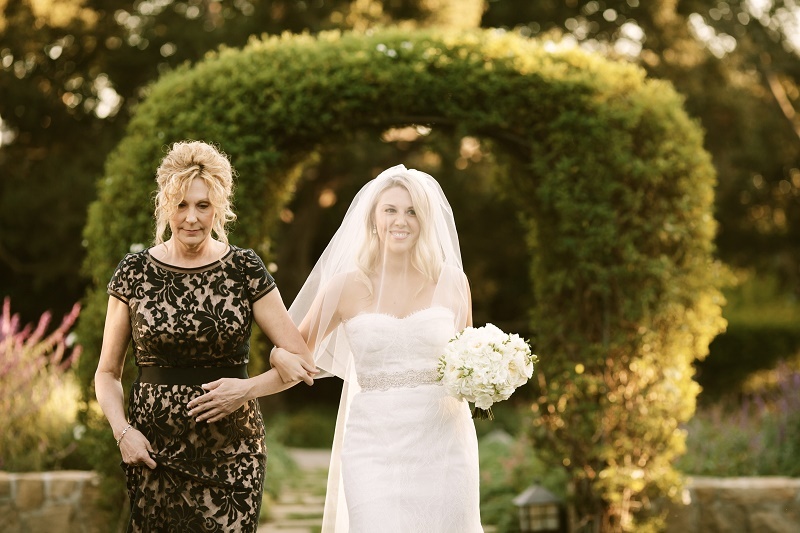 The groom was escorted down the aisle by his parents and Kelly’s mom did the honors for her bridal processional. 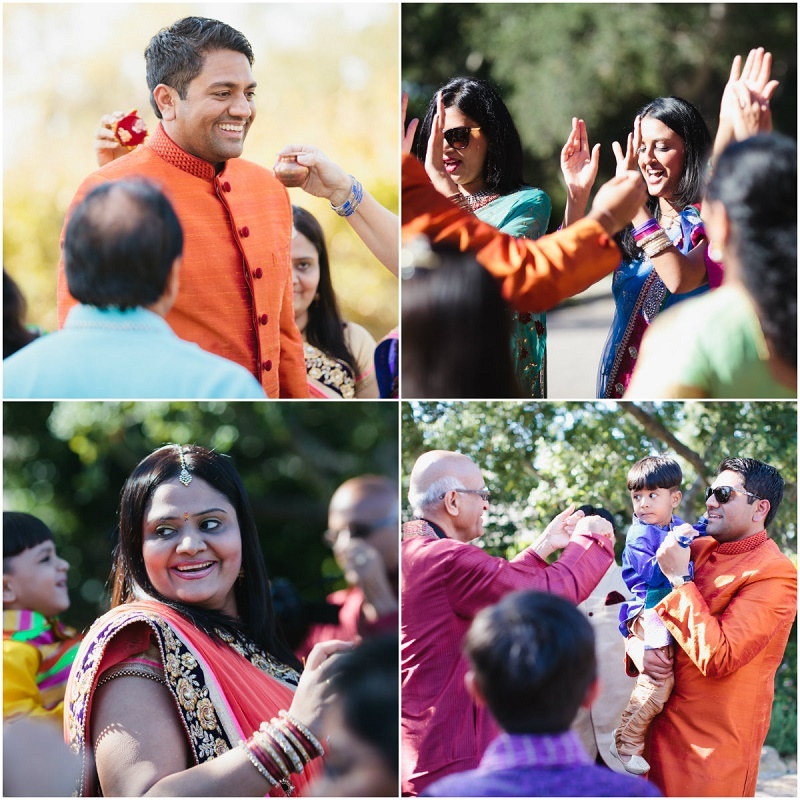 NOW ON TO THE PARTY! 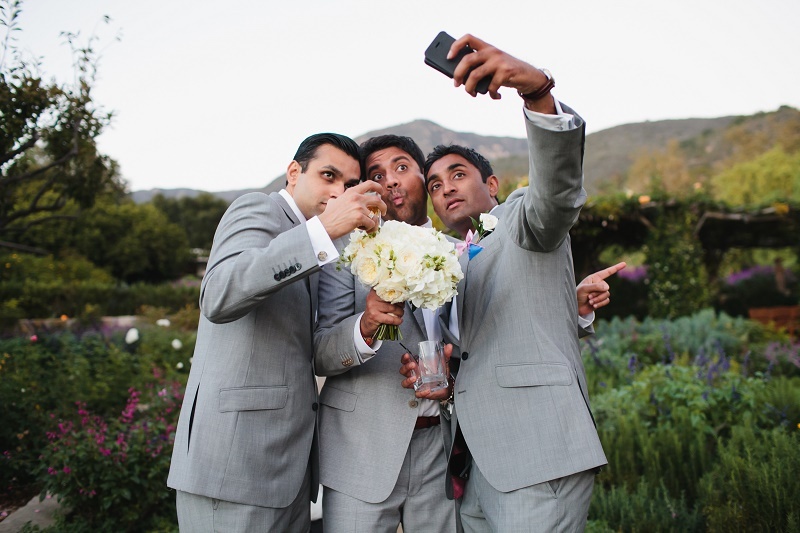 Leave it to Minesh and his groomsmen to get the party started! 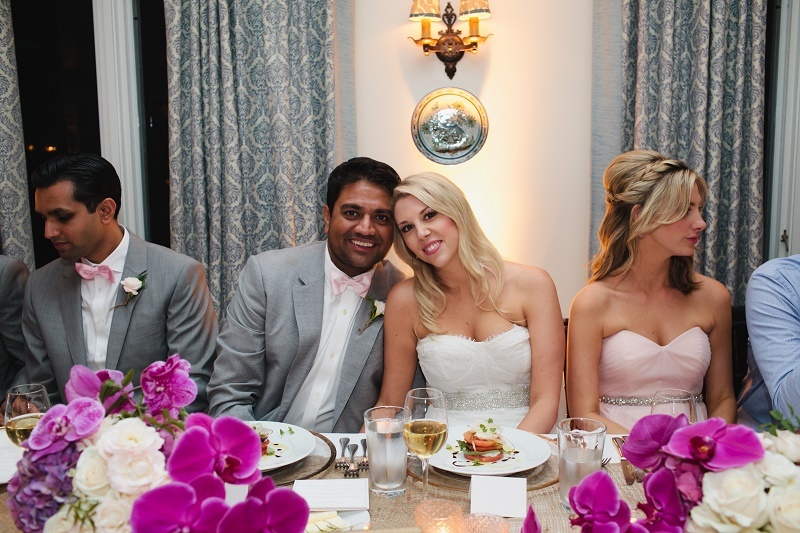 In the Hydrangea Cottage a seated dinner reception allowed guests to enjoy a delicious gourmet meal before heading out to the patio for some serious dancing! 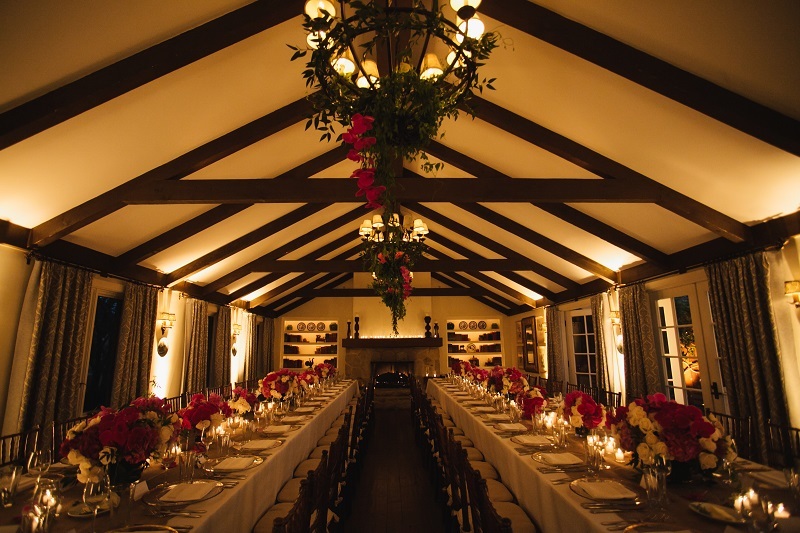 THIS CHARMING COTTAGE was an elegant home away from home with exposed wood beams, long feast tables and cozy atmosphere. 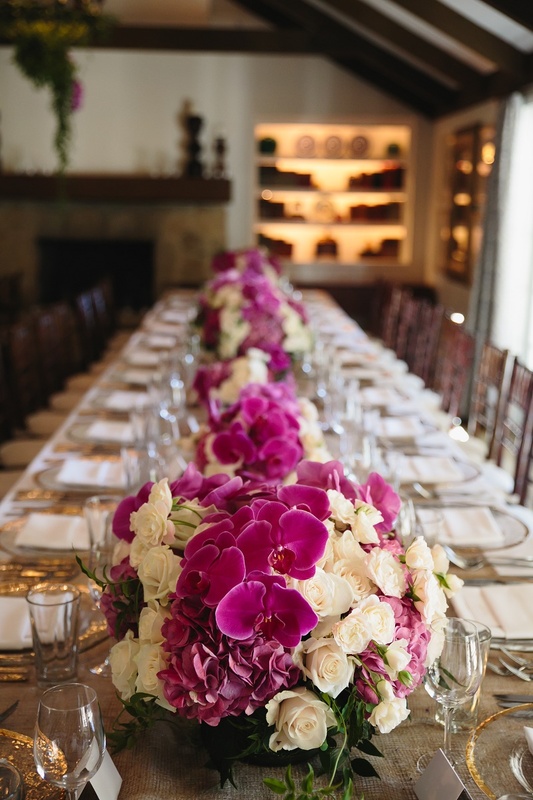 We dressed the dinner tables in ivory linens and wide taupe runners, gold rimmed glass chargers, votive candles, and dark wood Chivari ballroom chairs. 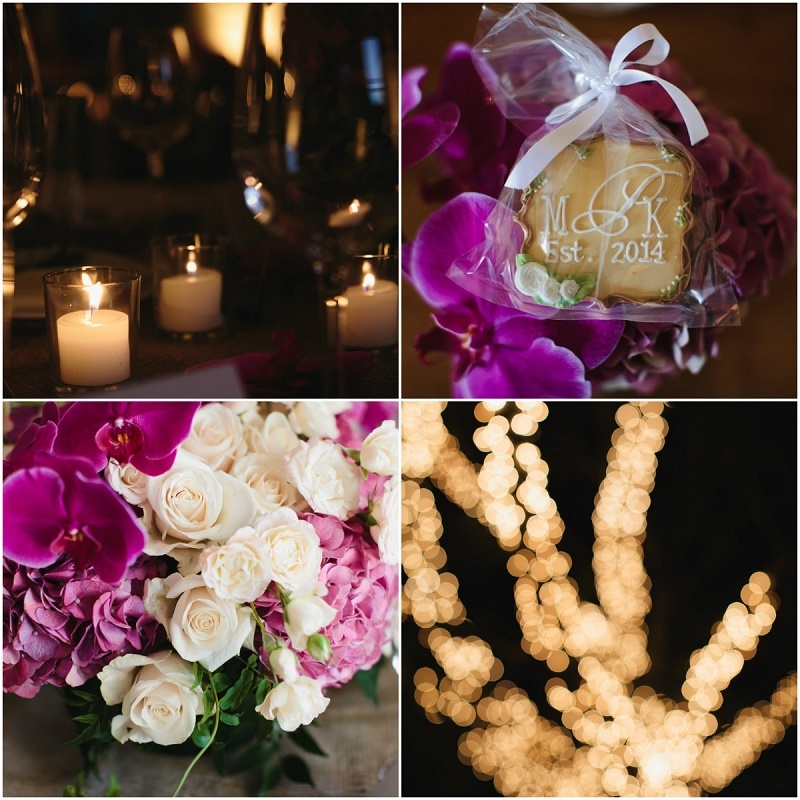 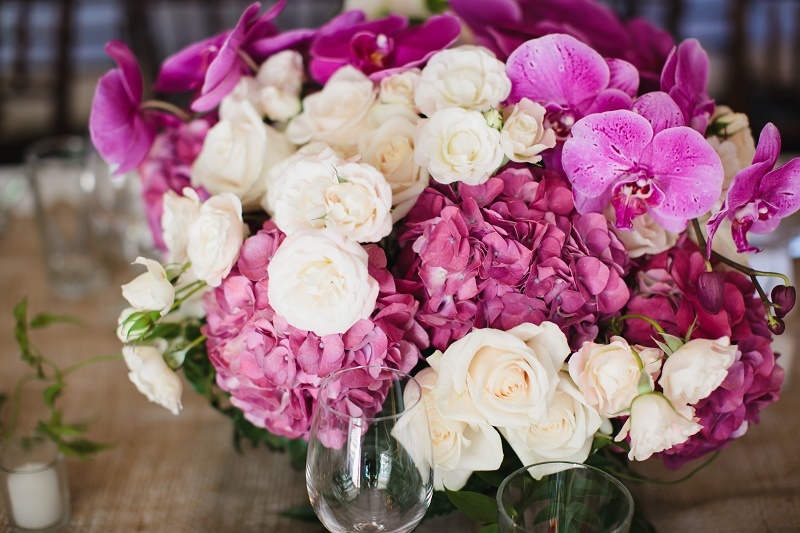 Down the length of the tables we placed lush low arrangements of ivory, blush, pink and magenta flowers. 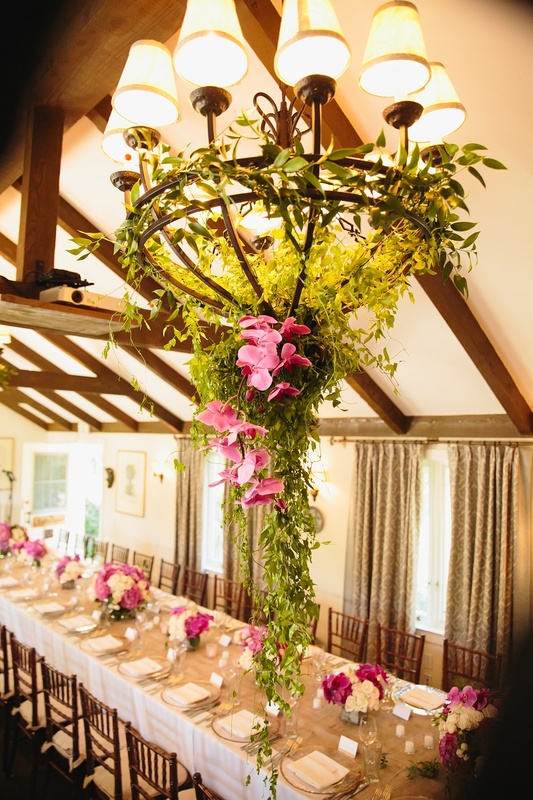 In the existing chandeliers we wove fresh greens and orchid stems to create soft, floral chandeliers. 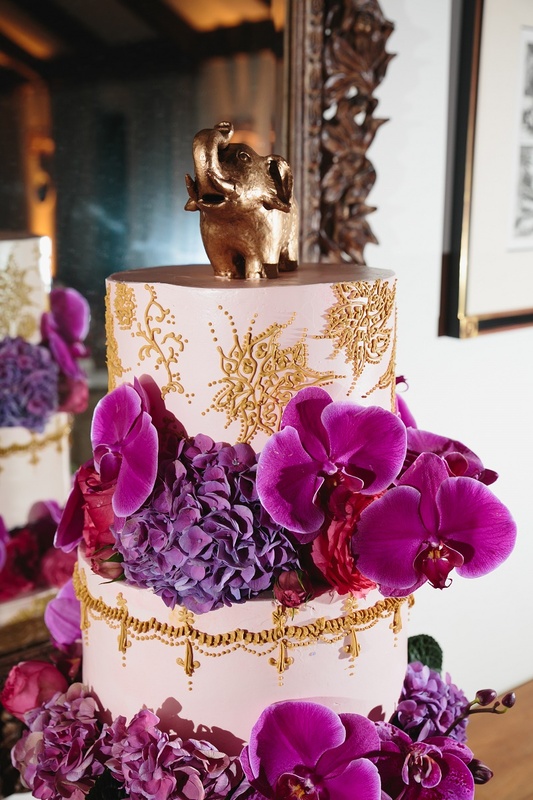 THE WEDDING CAKE MARRIED the best of both worlds! 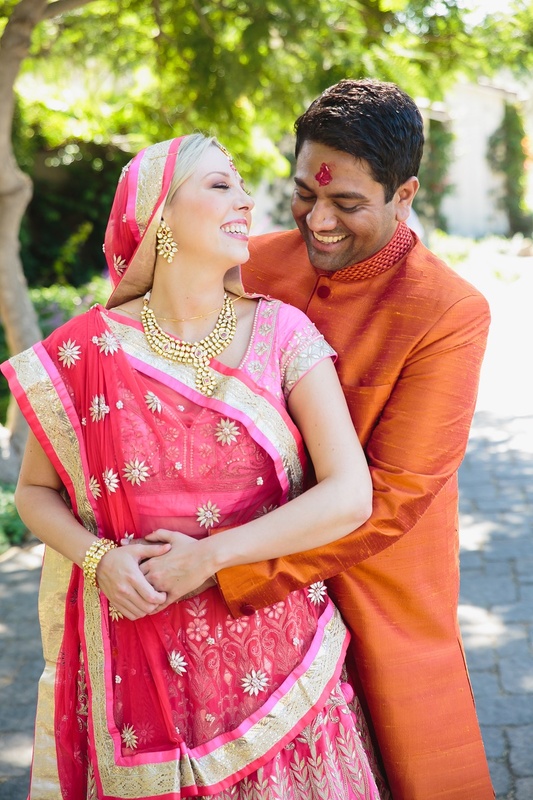 The entire wedding was an incredible expression of love, commitment and family… we thank Kelly and Minesh for including us in their celebration!